I have a problem. I cannot control my anger. When someone is arguing with me, I react. I am getting angry, nervous and counter attack. What shall I do to control my anger? Anger is likened to idolatry. G-d is Infinite, and He is sending us everything that comes to us. If you knew that person you are arguing with is being sent to you by G-d you would not get angry at him, but since you think that he or her is the one doing it, you get angry at them. Thanks a lot. So, in other words, what you're saying is that the person who's making me angry is eventually sent by God to teach me a lesson. You know I was actually thinking about this. Anger is idolatry. This means anger is a demon and by getting angry we're worshipping a demon not God which obviously is idolatry. You're amazing dear Rabbi! I love you! Peace and blessings to you! I agree with you. You're right. Then stop worshipping those people who are getting you angry. In other words, I have to remove those people who make me angry from my life, isn't it? No. If you do Hashem will send even worse ones. You have to figure out why Hashem is sending them to you. What are they coming to teach you? So, what you're saying is that this people are sent to me by God in order for me to learn something. That is certainly part of it but also look to see what they are doing that bothers you and see if that has any particular lesson for you. Ok. 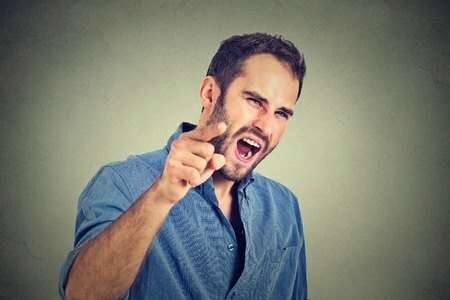 So, the question is, how to react or what exactly to do when someone's making you angry? What the best approach to a situation like this? First, when you get angry ask; "Why is Hashem sending me this guy? What am I supposed to learn from his disturbing behavior? What have I been doing that Hashem is trying to show me, so I will change." An example, if you have been speaking harshly to people and you feel that it is alright to do this, then some time later, depending on your merit, someone speaks harshly to you. You don't like it, but you have not yet realized that Hashem sent that harsh speaker to you to show you what you have been doing. So, you ignore him, or get angry at him. Then, sometime later someone else speaks to you harshly but really harsh this time, and you get angry at him for being harsh with you, but you still haven't put it together that It is Hashem Who is sending you the harshness to help you to do what you really want to do. If you have no merit you may not ever notice that this is happening. The more merit you have the more quickly and loud will be the experiences. So, all these things happen because of me and Hashem is in reality trying to correct me by sending these types of people into my life to teach me a lesson. Very wise indeed. In this case I should be quiet and reflect on the message Hashem is sending to me instead of getting angry and acting foolishly. You're genial Rabbi! So where's the free choice of 'the guy' (the annoyer, the harsh speaker) if sent by Hashem to teach someone else a lesson?